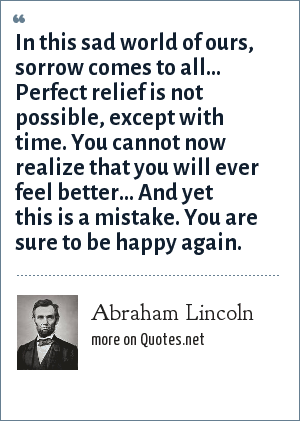 Abraham Lincoln: In this sad world of ours, sorrow comes to all... Perfect relief is not possible, except with time. You cannot now realize that you will ever feel better... And yet this is a mistake. You are sure to be happy again. In this sad world of ours, sorrow comes to all... Perfect relief is not possible, except with time. You cannot now realize that you will ever feel better... And yet this is a mistake. You are sure to be happy again. "Abraham Lincoln Quotes." Quotes.net. STANDS4 LLC, 2019. Web. 23 Apr. 2019. <https://www.quotes.net/quote/40955>.